14 (photo by Scott Kissell). 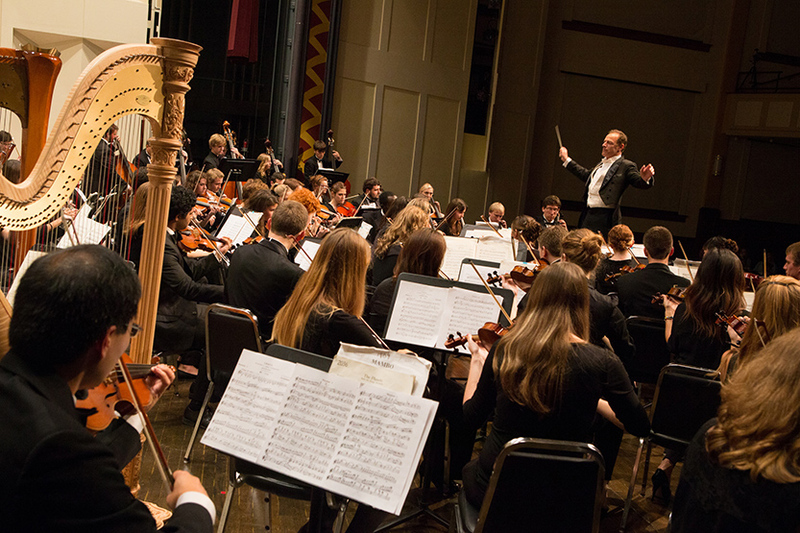 The Miami University Symphony Orchestra, conducted by Ricardo Averbach, will perform at 2 p.m. Saturday, March 14, in Hall Auditorium. The free concert is in conjunction with the College Orchestra Directors Association (CODA) 2015 International Conference. Averbach is president of CODA. This year Miami and Northern Kentucky universities are hosting the CODA International Conference March 12-14 in Cincinnati. The program includes Beethoven’s Overture Leonora No. 3 and Shostakovich’s Symphony No. 1. The program also features the world premiere of Romain Paillot’s animated movie "Dum Spiro" with live orchestra music and "a new breakthrough technology that provides state-of-the-art synchronization of live music with movies, called Muséik," Averbach said.